Meg Merritt is Principal in Nelson\Nygaard's new Austin office where she will be focusing on Emerging Mobility and the Texas transit market. Meg comes to Nelson\Nygaard from Moovel North America where she worked to develop the multimodal connected experience within transit mobile ticketing applications. Her past experience includes time at Deloitte Consulting supporting the FRA high speed rail grant program and at Capital Metro in Austin as a TOD Planner. 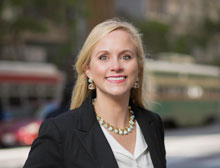 Meg has taught transportation policy classes at UTSOA and stays connected to research programs. She is a graduate of UT Austin and received her Master of City Planning from the University of Pennsylvania.